With contributions from the most accomplished scholars in the field, this fascinating companion to one of America's pivotal presidents assesses Harry S. Truman as a historical figure, politician, president and strategist. Assembles many of the top historians in their fields who assess critical aspects of the Truman presidency. 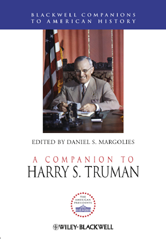 Provides new approaches to the historiography of Truman and his policies. Features a variety of historiographic methodologies.